You may use any available ATM location. No appointment is necessary. The rate for bitcoins that is displayed on the ATM is 7.90% higher than the website (the coincafe transaction fee is included in the rate). If you experience any problems, please feel free to reach out to us. After-hours support is available on a limited basis via text message to (917) 444-5458. Do not ask the store staff for help with the ATM. No one there can help you. This is brand new technology and may not always work as expected. Please contact us, we promise to fix any problems to your satisfaction! Note: this is an estimate only. Your rate will lock at the time your order is processed. Please note that our wire instructions have changed. Ensure the bank details are accurate before you send your wire transfer! We have recently revised our ID & Receipt upload requirements. We must have high quality images of your ID (front and back) as well as a clear portrait of you holding your ID by your face. If you've already uploaded these documents, you can disregard this message. Also you must write out CoinCafe.com Order #23892 on your bank receipt. We cannot deliver any bitcoins without clear color images of these documents. That means everything is done and ready to go. All you need to do now is wait for fulfillment. Your order will fill according to the schedule listed under Delivery Date. We plan to de-commission this payment option by April 15, 2019. We invite you to use our credit/debit card option to purchase as it is safer than mailing cash. If you have strong feelings about this, please feel free to email us at [email protected] to discuss. Our payment processing bank account is currently offline. Do not deposit any funds. We are working to bring cash deposits back online soon (1-2 weeks). In the meantime, please consider one of our Money Order options. Thank you for your receipt upload. We will validate your order. Keep an eye on this page for any order updates. If applicable, please also enter the Exact Amount You Deposited in the field to the right. Wire transfers are currently offline. Please do not send any funds via wire transfer. Sorry for the inconvenience, stay tuned for our new electronic payment options. Final Step Please print this page, sign and date it. 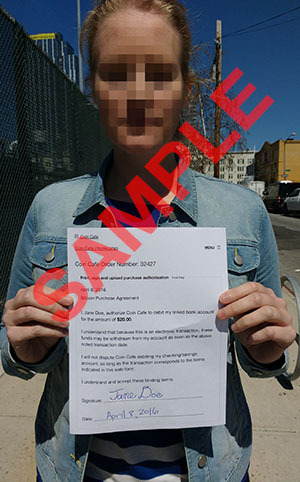 Snap a sharp and high quality photo of you holding the purchase agreement. Upload the photograph to this page. Electronic transfers are currently offline. Please do not send any funds. Sorry but our credit card processor has closed our account so we cannot offer credit card orders at this time. Please try one of our other Payment Methods. We are sorry for the inconvenience and will try to reinstate this payment option as soon as possible. Sorry but Walmart has suspended our MoneyCard account so we cannot offer it at this time. Sorry but PayPal has closed our account so we cannot offer it as a payment method at this time. The ATM is currently offline. It will be moving to a new location by summer 2015. Please stay tuned for the new address. In the meantime, you can create an in-person order and come to our office and give your cash to an on-site broker. Your order will fill while you wait. To make an in-person order, click here. NOTE: We only accept 50 and 100 dollar bills. Our payment processing account details have recently changed. Thanks for clicking! We're often asked why this 2-step procedure exists for wire transfers, so we wrote this explanation to help our clients better understand the reason for it. One of the biggest challenges in the legitimate bitcoin industry is accepting electronic payments from clients. One reason for this is that electronic payments have to be done on your behalf by a bank or other financial institution. And because there is a significant amount of wire fraud in the world, they tend to be overly careful when handling these types of payments. So if you ask your local bank or credit union to send a wire to Coin Cafe on your behalf, they may actually block the transfer and even go so far as to close your account if they suspect you are involved with buying bitcoins. Even though it is perfectly legal to purchase bitcoins for personal use, it is not legal to do certain other things, like purchase and re-sell bitcoins in volume without appropriate federal and state licenses. Banks can be overly cautious because of pressure from federal regulators, so they may choose to close an account (even if you are a longstanding customer!) rather than face undue scrutiny or penalties. Therefore, we have partnered with Crypto Capital to maintain the privacy of your transactions, and create a very reliable way to transact. Once you have an account with Crypto Capital, you will be issued your very own IBAN and unique account funding details. This means you can fund your Crypto Capital account by making a wire transfer from your local bank account to your Crypto Capital account. In this scenario, you will be sending money from yourself to yourself, avoiding any scrutiny from your bank. If your local bank is a European bank, you can also fund your Crypto Capital account with a SEPA payment. Once your Crypto Capital account is funded, you may easily transfer funds to Coin Cafe's Crypto Capital account. We hope this explanation helps you understand the payment process. p.s. Crypto Capital is based in Panama (with a banking partner in Hong Kong) and if you are a U.S. citizen, your account will technically be an "offshore" account. Contrary to popular belief, it is perfectly legal and legitimate to have a bank account outside your home country. You can use your Crypto Capital account as you would any bank account. Crypto Capital is a fully licensed and regulated financial institution.